In the contemporary world, the unborn - human embryos and foetuses - are highly public and contested figures. Their visual images appear across a wide range of forums, from YouTube videos to pregnancy handbooks. They have become commercial commodities as part of the IVF industry, reproductive tourism and stem cell research and regenerative medicine. The unborn are the focus of intense debates concerning concepts of personhood and humanness, especially in relation to abortion politics and the use and disposal of embryos created outside the human body. 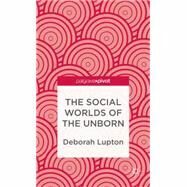 The Social Worlds of the Unborn is the first book-length work to discuss all of these issues and more, drawing on social and cultural theory and research and empirical research to do so. It will be of interest to academics and students in a multitude of disciplines, including sociology, anthropology, philosophy, bioethics, gender studies, media and cultural studies and science and technology studies. Deborah Lupton is Senior Principal Research Fellow in the Department of Sociology and Social Policy at the University of Sydney, Australia. Her most recent publications include Medicine as Culture, Fat and Risk.